Han Kuperus is a respectable doctor in the provincial Dutch town of Sneek. He has received an anonymous note informing him that his wife is having an affair with his friend, Schutter, and, in the opening chapter, he returns early from his weekly trip to Amsterdam and shoots the couple dead on a canal path near the cottage where they hold their trysts. Kuperus feels no particular emotion. Afterwards, in accordance with his routine, he goes to his billiard club where he finds that he is able to act quite normally. When he returns home he takes the sullen maid, Neel, as his lover. As a crime novel, The Murderer, is quite implausible. Nobody seems to notice that on the night of the murders Kuperus has arrived home a day early from his trip. And nobody reports that a man answering Kuperus’ description openly bought a gun that same afternoon. Had Maigret been on the case, the novel would be over in fifty pages. But the interest in The Murderer does not lie in its superficial resemblance to a crime novel. And suddenly, for the first time in his life, Kuperus did something that was really outrageous … Without waiting any longer for his guests, he poured himself out a full glass of wine. Gradually, as his peers begin to suspect his involvement in the murders, he comes to realise that, despite his efforts to conform, he has always been regarded as odd. And suddenly, he is no longer a respected pillar of the community, but a figure from whom children run in the street. The gradual disintegration of relations between Kuperus and his patients and peers is skilfully and subtly described. Here, as elsewhere in Simenon, middle class mores are a veneer concealing promiscuity, snobbery and deceit. Similarly, Kuperus is that Simenon archetype – the outwardly respectable professional who commits an act which precipitates his exclusion from society. The Murderer is also notable in its portrayal of the character of Neel, the maid. Simenon often portrays his secondary female characters as entirely submissive and devoid of any inner life. Maids and other employees are frequently sexually available and rarely express either any desire or objections about how they are treated. For much of the novel, Neel conforms precisely to this stereotype. In bed, Neel’s body is ‘passive’, her eyes ‘unfeeling’. Her indifference frustrates Kuperus. When he demands that she give up her lover, she responds absentmindedly that she to go to the butcher’s. When he presses to express what she feels about him, she responds: ‘Haven’t I told you that I don’t think anything at all.’ And yet, as the novel reaches its downbeat climax, we discover that Neel is not the docile drudge, she appears. Unusually in a Simenon novel there is something of a plot twist. This development is not contrived or brought about through authorial sleight of hand, but is one which alters our perception of the characters and action that has taken place. It is clever and satisfying. The Murderer is an very fine book. It contains all the elements of Simenon’s best work, rendered in cool, understated prose. 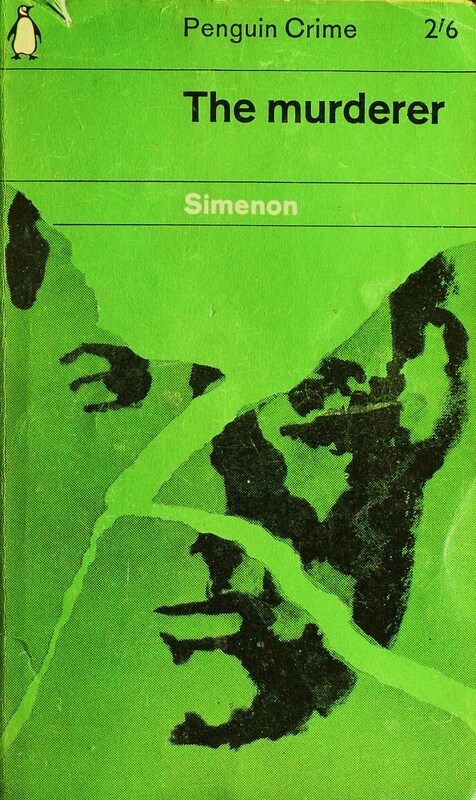 For the uninitiated, it would be hard to think of a better Simenon primer. First published as L’Assassin in 1937. Penguin edition published 1958, translated by Geoffrey Sainsbury. Cover design by Romek Marber.